Ideal for paddleboarders looking to add yoga practice to their SUP experience. 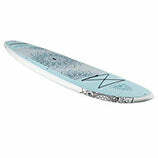 Stable, versatile shape and durable construction make it a great all around stand up paddle board. With stunning yoga inspired graphics and full length, premium deck pad, the Yoga Mat offers unmatched grip and comfort. With Ergo carry handle, Tool-less fin, side fins, numerous deck bungees and inserts. 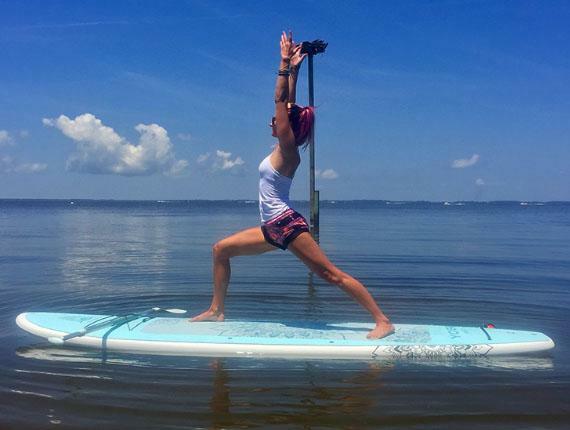 The Best Yoga Stand Up Paddle Boards you can find! 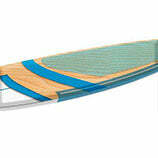 From 24 pounds with Durable Feather-Lite Molded Wood Technology, Yoga Deck Pad, 3 Fins, Deck Bungees & 2 Year Warranty. The Feather-Lite construction is more durable than Cruiser SUP's Ultra-Lite construction, but still remains extremely light-weight. 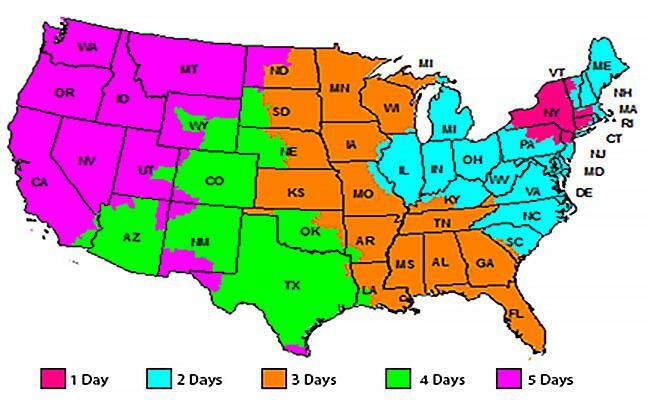 Weighing as little as 24 pounds, the Yoga Mat series can carry up to 230 pounds. This board is available is 10'6" and 11' sizes. Ample width allows higher volume and fantastic stability for beginners and yoga practitioners alike. The Yoga Mat paddle board is ideal for all users looking to add a fitness element to their SUP experience. The added durability also makes it a great option for family use. 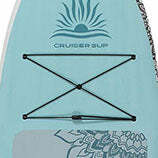 Cruiser SUP Feather-Lite boards offers a class leading, user friendly "soft & tough", high quality molded wood construction. Tough: In addition to two layers of 6oz. fiberglass on top and bottom, and 5 layers of fiberglass wrapping the rails, there is full-length wood reinforcement sandwiched between the fiberglass layers. Extra 6oz fiberglass reinforcement in the standing area to prevent heel dents. 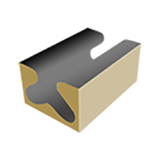 The quality 16kg EPS core is also strengthened by triple glass stringers. This is vacuum molded for extra strength, impact resistance, lighter weight and accurate shape. The result is a strong and durable premium construction. 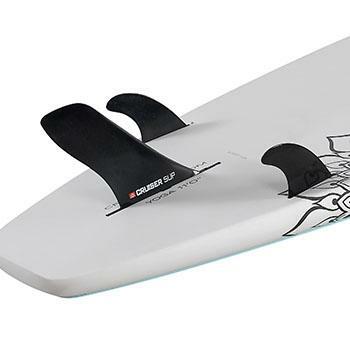 Soft: Cruiser SUP Crossover offers nose to tail high quality EVA foam deck pad for a soft, comfortable touch. With 4.5mm non-slip 'croc" texture in the standing area and thick, soft brushed EVA foam in the nose for carrying kids, it is also extremely comfortable for yoga. The rails are painted in matte finish (no eva foam) for improved performance and custom look. Optional Dura-ShieldTM (Poly-Carbonate) bottom layer, which also covers the rails and tail for extra ding resistance. The Feather-Lite Technology features compression molding of multiple layers of fiberglass, epoxy resin, and wood veneers. Standing area reinforcement and triple glass stringer round out the Feather-Lite Technology. The end result is a board that is light, stiff, durable, and exceptionally high performance. High quality, plush, full length EVA foam coverage for a soft, comfortable touch. With grip on entire top, and the "Yoga Mat" section the size of standard Yoga Mat - you have grip, comfort, and stunning graphics.